This was a well-earned weekend for the Pal Family, and what a day! It's back in the 60′s (which, for my Canadian readers, is like minus 13 or something). Our local gopher is nibbling on walnuts out back, and I just deleted my bookmark for my board review questions. And I'm pretty sure I fartleked today. Afterward, I drove the car to meet the family for lunch, windows down, and caught the last two movements of a live performance Beethoven's Fifth on CBC. There were lots of folks out on the trail today, and I'm sure that tomorrow there will be plenty in the office, so it seems a good time to go over a spring ailment. This time of year the poison ivy is just starting to leaf out, and with people getting back into their yards, I start to see a lot of intensely itchy rashes. Poison ivy leaves a rash typical of an "outside job"; often you can tell the eruption was caused by an external agent just by the pattern. There tends to be small blisters, many of which occur in distinct lines where the plant brushed across the skin. It's a pretty benign rash, but horribly uncomfortable. Occasionally, people can develop a secondary immune reaction, or the rash can become infected with bacteria, creating a honey-colored crust on top. The best treatment is avoidance. Learn where the poison ivy is in your area, and stay the hell away from it. My daughter has been able to recognize it since she was three; I don't want her to associate hiking with itching. The rash is caused by oils secreted by the plant. Once you have showered in soap and water, you cannot spread it or give it to others. People will erroneously believe they have spread it because the rash can develop more or less rapidly and intensely in different areas, but these are areas that were usually exposed at the same time. 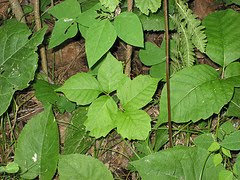 Once you realize you've been exposed, the best you can do is take a hot, soapy shower, and put all of the exposed clothes into a hot, soapy wash.
Berry brambles and other benign plants often grow in the same areas as poison ivy. If you're not absolutely sure, don't touch it. If you do get the rash, your doctor will probably prescribe an antihistamine such as oral Benadryl for mild cases. Benadryl and calamine creams are usually not helpful. There was plenty of the stuff growing along the rail trail this morning, something to distract me on my run. Running sometimes scares the hell out of me. I think it's the fear of discomfort or the fear of not being able to do it. Last weekend I hit the trail and after about 100 meters, I was done. I just. Couldn't. Move. Today was much nicer. As I mentioned, I tried the whole fartlek thing, and while I only did about two miles (for our neighbors to the north, about 1,200 centimeters or something); the variation made it much more interesting and much more comfortable. I suspect this fear is what keeps a lot of people away from exercise, especially those who have been away from it for a while. I try to encourage my patients to get back into exercise slowly, to remind them that any physical activity is better than none. We tend to be wired to fall back on old and easy habits and when we don't exercise for a week, or we don't lose 20 pounds, we give up because we all know it's much easier to sit on the couch eating Mallomars. So put down the cookies. Get out there, hit the trail, even if it's only a few hundred yards (or for our Canadian neighbors, three Imperial gallons or something).